This air filter is made by Acrol UK, a company that has been designing and manufacturing Microclene air filters for 18 years. Microlene filters are assembled in England and sold in 14 countries around the world. 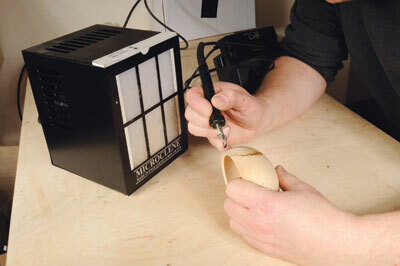 Wood smoke is very harmful to the lungs and the MCP pyrography air filter is specifically designed to absorb the smoke from pyrography and the fumes from any solvents you may use. It can also be used when soldering to take away the fumes produced by the flux. There are two sandwiched filter elements in the filter cartridge: a G4 dust filter - white - and an activated carbon filter - black - to remove fumes. It is designed to be used with the filter facing towards you - about 300-500mm away - so the work is between you and the filter. The filter has an airflow label on the top which, when correctly installed, should have the arrow pointing to the rear, so that the white filter is at the front. It is very easy and quick to replace the filter cartridge; you only need to pull it upwards out of the slot, and push in the new one. The unit is very compact at 200 x 130 x 165mm (8 x 51â„8 x 61â„2in), uses only 35W, but will filter 120mÂ³/per hour. It stands very easily on the work surface and can be placed very near to your work. The unit is nicely designed, has a pleasing appearance and is finished in a durable black paint. I used it whilst I was pyrographing some leaf designs onto the outside of a wooden bowl. I held it quite close to the filter unit, and although I was very near to the burning tip, the smoke was very effectively drawn to and absorbed by the air filter, and I did not breathe in any fumes. I also tried it with my Presto dental handpiece, which actually burns holes through the wood, and generates a lot of smoke. I was pleasantly surprised that it coped very easily with the fumes from this, and drew them away from the bowl. 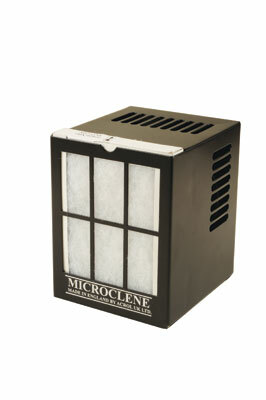 This air filter unit from Microclene is more effective at removing smoke and fumes than any unit I have tried before. In fact, I liked it so much that I would probably buy one. I liked this compact unit a lot. It was wonderful at dealing with the pyrography fumes when tried on bowls and other work. There is oodles of power in this unit and it is not too noisy when used for long periods of time. I also tried it for use when power carving small-scale work and it also coped with that. Whilst it costs a bit of money, it does work so well.